The CoffeeTEAM GS lets you program the amount of coffee you want to grind: choose from 2, 4, 6, 8 or 10 cups and select mild, regular or strong. The coffee filter holder stays inside the machine during grinder preserving more aroma and reducing mechanical movements. You can even program two completely different settings, one for manual operation and one for automatic operation. This way you always enjoy exactly the same coffee taste. The CoffeeTEAM uses solid steel conical burrs, the same as found in our automatic coffee centers. The slow grinding of the burrs imparts minimal heat preserving more aroma than blade grinding. It also allows a finer and more uniform grind than combination machines with a blade grinder. Five fineness settings for light to dark beans let you adjust the grinder to your preferred beans (the darker/oilier the bean, the coarser the setting). 6 ounce bean container. Direct-feed technology accommodates a more compact design while keeping moisture away from the grinder. The CoffeeTEAM GS grinds the programmed amount of beans directly into the filter and then automatically initiates the brewing process. AM/PM Programmable Clock/Timer lets you set the time when to grind and brew automatically. The easy-to-read LCD display shows the time, grind and strength settings. Charcoal water filter removes up to 82% of chlorine and other impurities. 10-cup Glass Carafe. GoldTone Filter included. CoffeeTEAM GS can also be used with size 4 filter paper. Over 200 degrees F brew and 180 degrees F coffee temperature in glass carafe directly after brewing. 2 Hour Safety Shut-Off will keep the coffee hot for two hours after brewing. Then the heating element will shut off by itself conserving energy and giving you peace of mind. 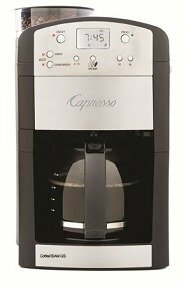 The unit can be used with or without the grinder, accommodating pre-ground coffee, including flavored coffees or decaf. Choose the BREW MODE for pre-ground coffee or GRIND/BREW MODE for whole bean coffee. Stop-and-Serve lets you remove the carafe while brewing to serve a quick cup.